The University of Leicester Institute of Lifelong Learning presents a series of public lectures as part of the new Vaughan College Lecture Series, to be held at Vaughan College. All lectures start at 7pm and are 40 minutes in duration, with an opportunity afterwards to ask questions. All lectures are FREE and open to all. This article discusses the Rakentajamaalaukset murals (translated as ‘construction worker painting’) which appear in fifteenth and early sixteenth century Finland. Traditionally criticised as ‘primitive’ and ‘popular’, art historians have frequently perceived the subject-matter as anomalies beyond Christian iconography and outside the canon of western medieval art. Researchers have ignored their religious context, connecting the subject-matter to ‘popular’ culture and beliefs such as medieval magical practices, paganism and folklore, and viewing the paintings as child-like imitations constructed by an untrained local hand. 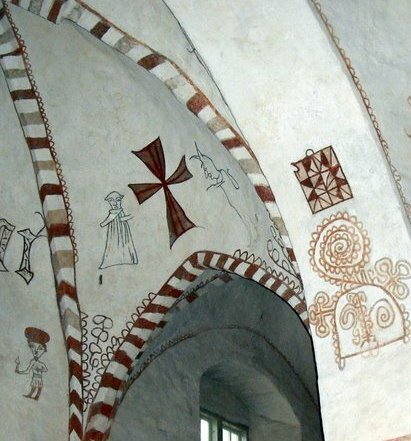 Rakentajamaalaukset Wall Paintings, Maaria Church, Turku, Finland. 1440s-1450s. Figures Include a monk, a devil and a cross. Fält argues that the labels ‘primitive’ and ‘popular’ are false, modern divisions, and that there is no evidence to substantiate the painters as unskilled local people, nor the subject-matter with paganism. She points to the discontinuity between the modern and medieval understanding of imagery such as the Rakentajamaalaukset, and suggests that the typology challenges twenty-first century viewers to step outside conventional art historical thinking. As yet, the visual language of this extensive and diverse body of works is not fully legible and paintings cannot be accurately interpreted. Dr Katja Fält is a Researcher at the University of Jyväskylä, Finland. Read the article online: Fält, K., ‘Attitudes and Discourses in the Historiography of Finnish Medieval Rakentajamaalaukset Paintings’, St Andrews Journal of Art History and Museum Studies, Vol. 15, 2011, 31-39.